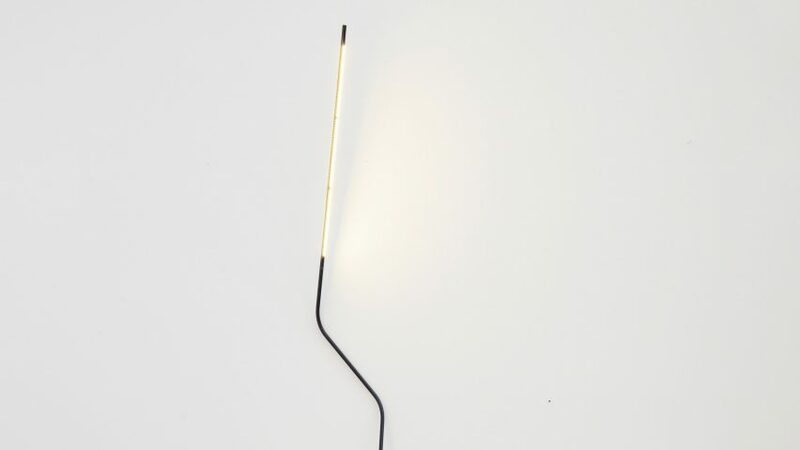 German designer Bernhard Osann curved a rod to make this simple light, which leans against a wall and can be rotated to create different effects. 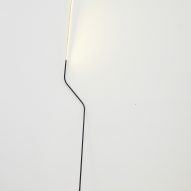 Osann designed the Neo light, which was unveiled at this year's IMM Cologne furniture fair, after breaking the base of a previous design. 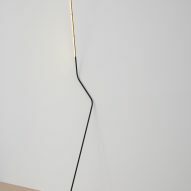 Trying to find another way to support the standing lamp, he bent the steel rod in two places so it could rest stably against a wall. The minimal shape also allows the light to be rotated, offering either direct or indirect illumination without the need for a lampshade. "I worked on a normal standing lamp and I had problems with the base and I got a bit angry and broke it," Osann told Dezeen. "Neo is a standing lamp without a base and without a lampshade." 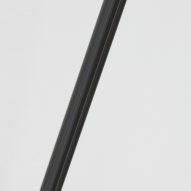 LED modules are embedded in the profile of the upper part of the rod. When facing the wall, they create a diffused glow against the surface, while turning the lights away offers a sharper illumination. 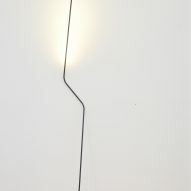 Silicon is used for the points where the lamp leans against wall and touches the floor to secure the standing position, while cooling vents on the reverse of the upper lighting segment prevent overheating. Neo was on display at IMM Cologne, which took place from 16 to 22 January 2017. Other products that launched at this year's event include mirrors by Meike Harde that sit askew in their frames, a hybrid bed-desk by Pieter Peulen and a copper clock by Patrick Palcic that uses perfume to tell time.